The human anatomy program at the University of Guelph is one of a kind. Human Kinetics and Biomedical Science students are granted the unique opportunity to participate in a full-body dissection during their third year of undergraduate study. This invaluable experience allows students to study anatomy in a hands-on, interactive setting, which past students have identified as one of the most valuable and rewarding experiences of their undergraduate career. With the variety of undergraduate courses that are available, students can be involved with the program in many ways; choosing to participate in dissection courses, or learning from prosections. A 4th year advanced study allows students to work as a team in a self-directed fashion, learning leadership skills and facilitating outreach programs for career colleges, highschools, and health professionals. Human Anatomy at Guelph prides itself for the level of respect students, staff and faculty hold for the generous educational gift that donors have provided for the students. This is highlighted every day in the classroom and laboratory, as well as through the Celebration of Life and Learning which is hosted annually, giving students the opportunity to honour the donors and their families, who make this experience possible. Future donors, who are also invited, look forward to the celebration every year, where their interactions with students make them an important part of the Human Anatomy family at Guelph. All the undergraduate programs within HHNS provide students with a common science core so that you can be prepared for almost any upper year science course! The courses you then take will be tailored to your major, with multiple electives allowing you the freedom to explore the areas that interest you most. 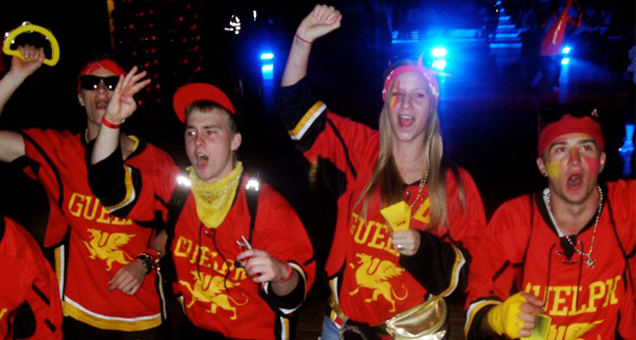 Guelph understands there is more to your university experience than solely academics! The campus is overflowing with opportunities to get involved in extracurriculars. There are student associations for every major within HHNS, and these groups work hard to provide events such as a yearly formal and trips to Blue Mountain. Gryphon athletics provides an avenue to get active through intramural leagues, or cheer on your varsity teams with friends. College Royal takes place every spring with open houses and events to showcase U of G to the community. Volunteering is also a great way to help out in the community while gaining hands-on experience. The HHNS department has put together a volunteer database of clinics and businesses within the Guelph region that are open to hosting student volunteers. Never let roadblocks stop you from achieving success! The University of Guelph offers a variety of academic support services which are readily available to help you sort out any problems you may encounter. Academic Clusters allow you to share a living space with other students in biological sciences. The Learning Commons in McLaughlin Library is a space where you can access workshops and get study help from students and staff alike. Supported Learning Groups (SLG's) are offered for many first and second year courses, providing valuable resources such as mock exams.